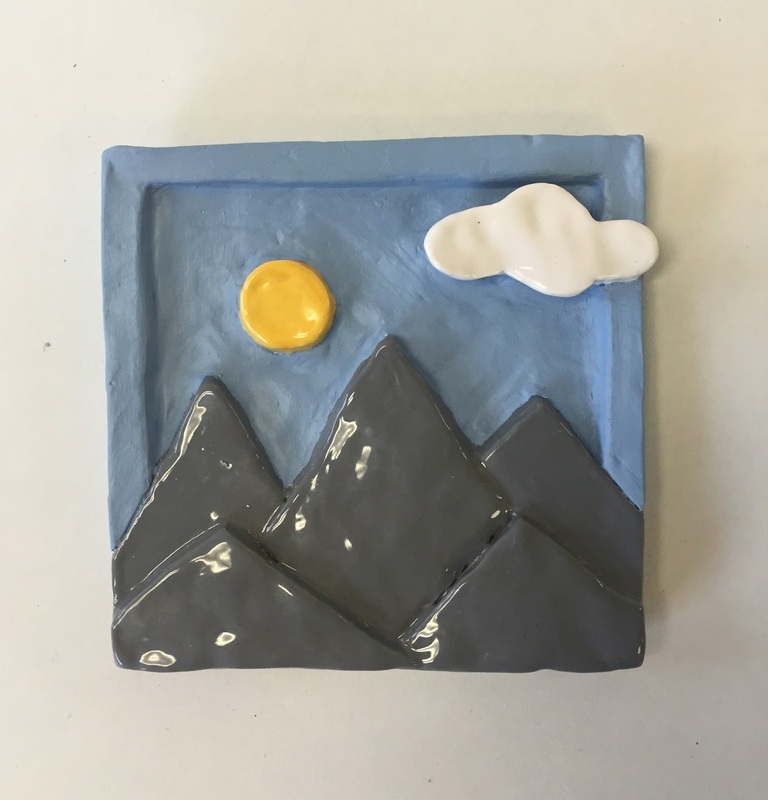 I want to make a mountain landscape on a clay tile. There will be a total of 5 mountains, the sun, 2 clouds and a border on the tile. I will remove some the sky in the background but leave the clouds and sun. The clouds will be built up over the border and so will the mountains. The closer the mountain the more built up it will be. Looking at my original plan my piece was pretty successful. The mountains layered well like I planned and the sun and clouds pop out well. Also the colors I chose compliment each other well and the glazed mountains, cloud and sun look good against the arcryllic sky. Next time I would make the mountains have more dimension and I would shape the cloud to look softer. I think if I were to do the project again I would plan something more intricate and creative and not so simple. Originally I planned to have two clouds on my tile but soon after I began scultping I realized there was not enough space for two. My sketch also made the mountains look more dimensional because of the shading and the clouds were more round. 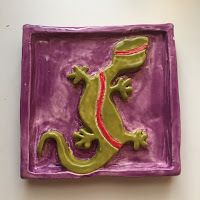 The mini tile project helped me get a good idea of how to use relief with clay and gain basic skills with clay tools. 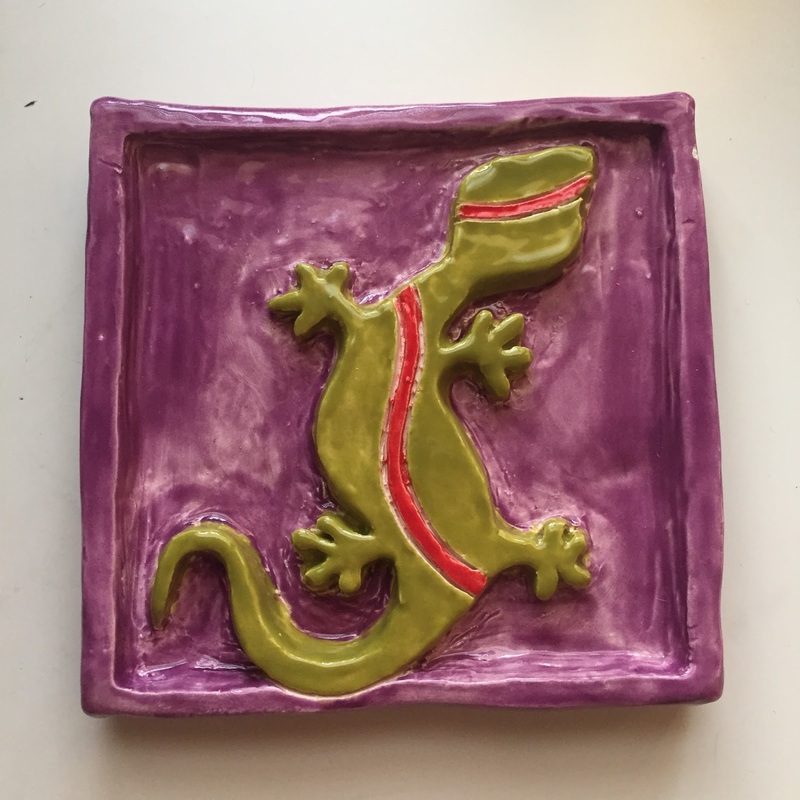 One downside of the mini tile project, which was my fault, was that I did not think of how relief can be created outside of a flat clay tile. The cardboard project showed me relief can be created through other mediums rather than just with clay. Throughout this project I had to overcome building up objects without losing the shape of what I was trying to create. Since my peice was so simple I had to really focus on perfecting the simple shapes. My battle with having such a simple piece worked out for me in the end because I recieved many compliments.